Aaron Frost introduces a RxJS as a trend that is also a fundamental for angular. Aaron Frost shares his experience at ng-conf where the community was polled, and the topic most people wanted to learn was RxJS. 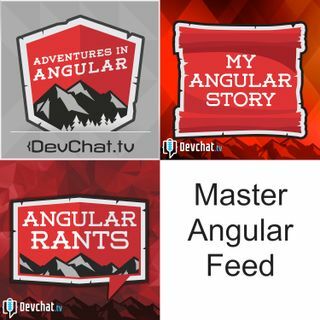 Charles Max Wood brings up a ... See More previous podcast where Ward Bell predicts this trend, sharing the opinion that angular developers must know RxJS to be successful. The panels discusses the need to be reactive in Angular and the need to react to this trend by learning RxJS. Michael Hartington and Aaron Frost share an examples to show how RxJS simplifies the work.The panel discusses the switch from NgRx or RxJS, and a few things that might help someone looking to switch. Panelists share how they learned RxJS and how it helped them, even if they were reluctant to learn it. They finish by sharing resources they found helpful in learning RxJS.